Wanted to give the service Boxcryptor from the German company Secomba a try. For private use the application is free. Unfortunately I had to realize that the application is not only free but also persistent in its refusal to be deinstalled from Mac OS X system. 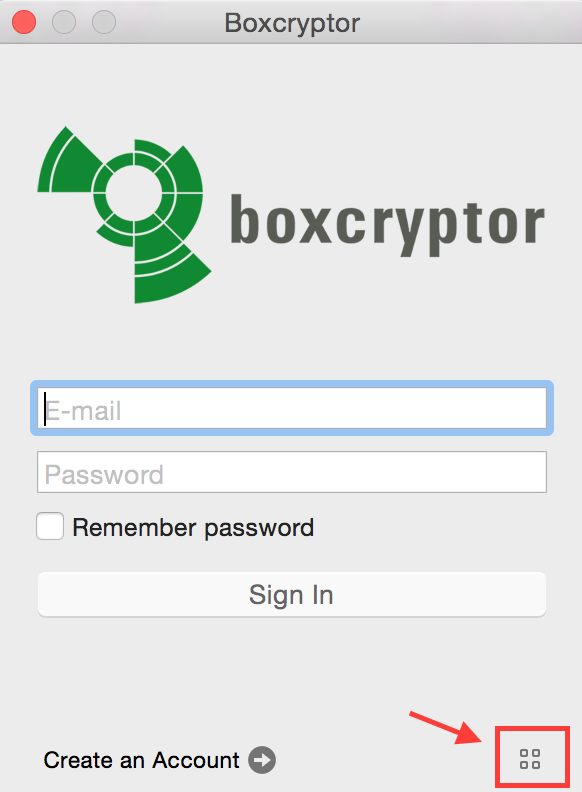 Recently heard a lot of positive reviews and comments on the Boxcryptor application. It is a small app that allows encrypting individual files before uploading them to a cloud provider. To make this happen, the application creates a virtual harddisk. This disk is then in the background linked to the file locations of the cloud file sharing provider. The list of supported cloud providers is enormous. I was personally especially interested in hooking this up with Apple iCloud Drive and Microsoft OneDrive Business. Still searching for a way to make use of my OneDrive Business account after the first attempts were not really fruitful. Also I was hoping to find a replacement of Truecrypt since the application is not further developed and maintained anymore. I downloaded the DMG installer from the Boxcryptor website. Installing the application on the Mac is easy. Just move the app to the Applications folder. Afterwards you can start the app. You have to register with a username (valid email address) and a password. I am happy that Boxcryptor allows creating “local” user accounts. This means that the username and password is only stored on the local computer. 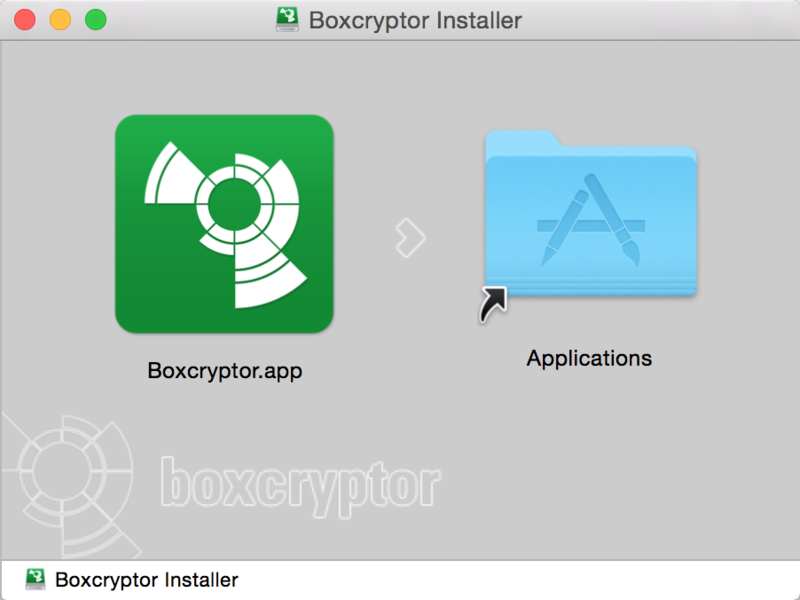 By default the application however suggests creating a “Boxcryptor” user account. The username and key are then stored on the Boxcryptor server. Advantage is that you can use the same account also on other devices / computers. In the free version it is possible to use up to two devices with one account. The tiny button where you can switch between local and cloud user storage is easy to miss. It is a at the bottom right corner of the login screen. The application then asks for admin rights on OS X to install an additional service. 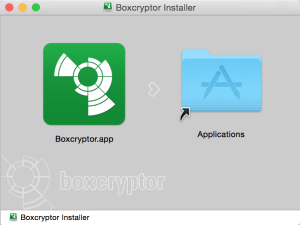 This service will later cause problems when trying to deinstall Boxcryptor. I have not done a really detailed review of how Boxcryptor technically works. So allow me to describe how the user experience looks like. The application checks which cloud file services are already installed on the computer. In my case it was only Apple iCloud Drive. iCloud Drive is then added as a so called “Location” in Boxcryptor. The term “Location” actually works quite well for me. Reason is that Boxcryptor is not really a client application for all these cloud providers. So it never “talks” directly with Apple iCloud, Google Drive, Microsoft OneDrive, etc. Instead it only reads and writes from the directory on the hard disk that is used by the respective cloud client software. So the term “Location” refers to the directory on the hard disk. 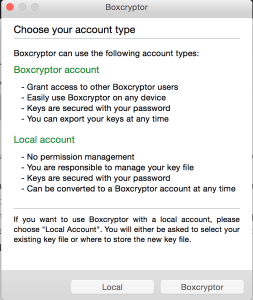 Please note by the way that the free version of Boxcryptor only allows one “Location”. If you are using more than one you have to get a version with annual fees. The Apple iCloud Drive client is constantly monitoring the above directory and synchronizes it with the cloud servers. Boxcryptor creates a virtual hard disk that then shows all locally installed cloud services (“Locations”) in one spot. So you can then find all these services centrally in your Finder Favorites under “Boxcryptor”. There is also a virtual disk called “Boxcryptor” created (you can change the name in the settings if you do not want it to be called this way). What is then the added value of Boxcryptor if it is basically “just” a directory viewer for the cloud services running on the computer? Well, if you click on a file inside the Boxcryptor view, you have additional functions now in your Finder options. You can now encrypt individual files by “right clicking” on them. After encrypting a file, it is then marked with a small green sticker. 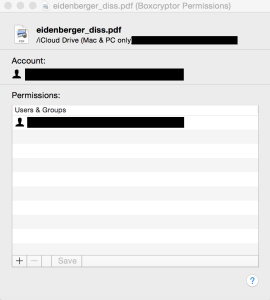 If you now directly open iCloud Drive, you will see that the file was renamed. The ending “bc” (Boxcryptor) was added and the file can thus not be opened anymore without the Boxcryptor client and the username, password combination. The paid versions of Boxcryptor also allow encrypting the complete file name to make it harder to guess what could be behind it. The free version seems also to have a file limit of 2 GB (have not tried it though). All file handling and synchronization is done by the cloud provider app. 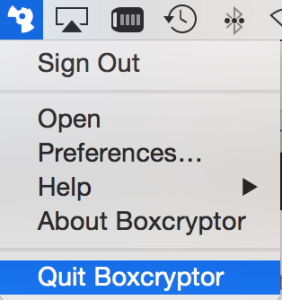 Boxcryptor is a viewer that allows opening encrypted files on the fly and encrypting additional files/directories with two clicks. It is not responsible for any file transfer / synchronization in the background. 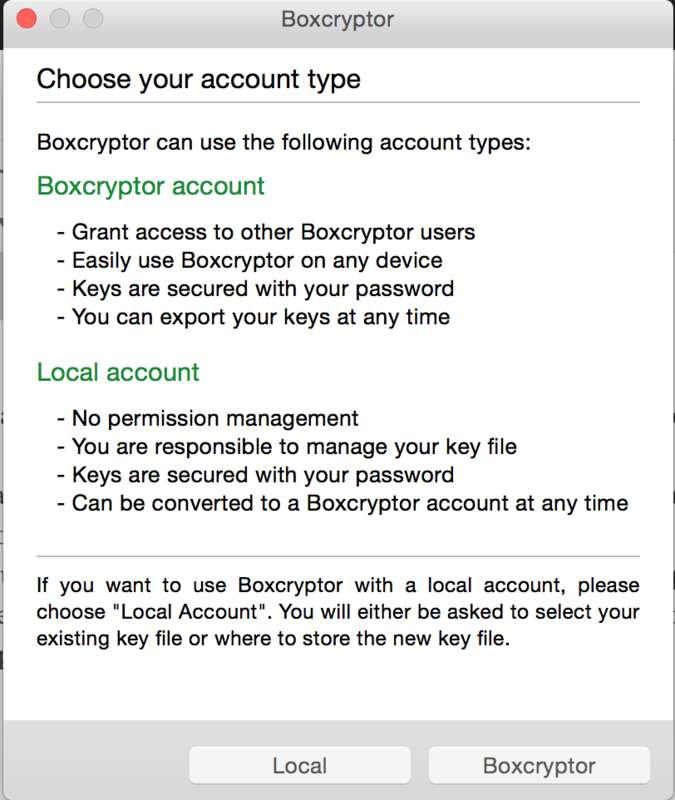 In addition the Boxcryptor application allows to add permissions for other users to read the encrypted file. So for example if you want to share a cloud file directory or send the file via email. This only works if you choose the option to use the cloud stored Boxcryptor username where your credentials are stored on their servers. The IT website Heise.de mentions that the application uses AES-256 encryption. The software is built upon the open source Encryption File System (EncFS). Both can be considered as very good at the moment. I am however not in the position to judge if Boxcryptor has properly implemented all of this. I personally like the idea of Boxcryptor. It makes encryption quite easy and you can use your encrypted directories stored in the cloud on the fly without the need to for example mount a Truecrypt container or manually decrypt/encrypt files when using them with a text editor, etc. Also synchronizing huge Truecrypt containers is often a hassle. Here each individual file is encrypted. On the other side I was a bit disappointed that it is “just” a viewer of the hard disk directory used by the cloud provider application. This is of course smart because it avoids the need to manage all of the different APIs/protocols used by the providers. 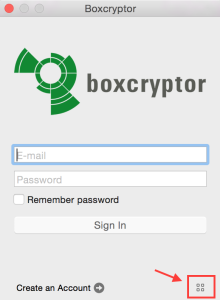 Also it means that Boxcryptor does not know the cloud username and password. For me the application does not offer a huge additional benefit. I would have loved it if it would be a usable client for Microsoft OneDrive Business. Microsoft themselves have not managed to create an app that is usable on the Mac. I am also sure this will not happen very soon since they used SharePoint as the backend so far. The “on-the-fly” encryption alone is for me currently not really appealing because I do not use cloud services to store sensitive information. I find it great that Boxcryptor offers a free version that works with one “Location” and can also be used to test it with up to two devices. 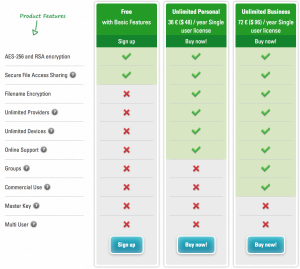 The paid versions are not really cheap if you compare it with the prices of the cloud storage providers. For little more than twice the price of the cheapest Boxcryptor version I can get 1 TB of storage with all data transfers included. But of course this 1 TB of storage does not include any real encryption. So for me personally the answer to the above question is: It is not useful for me right now. But I will keep it in mind as a potential option. Usually uninstalling applications on a Mac is quite easy – at least if the developers have done a good job. In a normal world I would just quit the Boxcryptor application and then delete it from the Application folder on my Mac. Unfortunately Finder then complains that “Boxcryptor.app” can’t be moved to the Trash because some of its plugins are in use. In the preferences of Boxcryptor you can switch off that it is loaded at computer startup. But deactivating this and then rebooting the computer also do not help. Checked on Google and the Boxcryptor website if there is an uninstaller. A few comments mention that there is an uninstaller script in the DMG installation package. It seems that this was true until version 1.3. I have installed and tested version v2.1.425.631. There I could not find any uninstaller script in the package (although I might be blind). Further Googling then led me to this German website where the author removed it the hard way: By using an application called CleanMyMac. Personally I hate using these often shady tools to remove applications and somehow miraculously speed up the computer. But it seems to be the only way since I do not know where Boxcryptor is but its teeth into the Mac OS system. Good thing about CleanMyMac: They mention how to fully uninstall their application again. It would be great if Boxcryptor could also follow their example and also allow a proper deinstallation after testing. CleanMyMac is free for the first 500 MB of disk space you free up. Luckily Boxcryptor is only less than 30 MB. So this works and I was able to remove the application (although I am not 100% sure that CleanMyMac really finds all components).